In part one of our series on renting out your property, we measured many of the pros and cons of being a landlord. It's a good idea to weigh your options from both sides before taking the leap into managing an income property. If you’ve decided that an investment property or basement suite is something you want to do, here are the steps to take on your way to becoming a landlord. This was mentioned in our previous post about being a landlord, but we believe it's important enough to mention again. Before you decide to rent out a property to anyone, consider your privacy once more. This is especially important if you are going to rent out space in your own home, such as a room or your basement. Will the extra income be worth giving up some privacy? Is it worth potentially changing your lifestyle? It's a big decision, so make sure you're comfortable with the one you make. There is a significant amount of legislation you need to be aware of when renting out a home to someone else. First and foremost is Alberta’s Residential Tenancies Act (RTA) which deals with everything from the roles and responsibilities of landlords and tenants, laws regarding ending a tenancy agreement, and how landlords and tenants can resolve conflicts they can’t resolve themselves. The RTA will inform you of what you can and cannot do as a landlord, but there is also other legislation in place you’ll want to know about so you're on the right side of the law. These include the Alberta Human Rights Act, The Public Health Act, as well as municipal bylaws that could affect your ability to rent out your property. The best advice can always be given by those that have the most experience. There are quite a few places you can turn to for advice, including the Canada Landlords Association, the Alberta Landlords Association, and the Real Estate Investment Network. These organizations have several helpful online resources, as well as forums for you to ask your questions directly to other landlords. When determining how much to charge tenants, don’t set your monthly price by how much you need to make for it to be worth your while. Instead, calculate it based on how much someone will pay. While there are no rent controls in place in Alberta, it’s important to look at comparable rental properties in your area to see what you should set your price at. As you do this, always consider how you will compare to others in the area, and set your price around that of similar properties in the area. This is a step many landlords tend to overlook, but doing so could end up costing you in the end. If a tenant were to cause large-scale damage to your rental property, such as by a flood or fire, your insurance company may reject your claim due to not being informed you were renting in the first place. It’s possible your insurance could increase, but the potential costs of not advising your insurance company make it worthwhile. Plus, you’ll be able to use the expense as a tax deduction. As an additional precaution, advise those renting from you that they will need tenant’s insurance to protect their own property. Once you become a landlord, you'll need to make sure you're prepared for a few extra expenses. You'll be required to pay for maintenance, property taxes, repairs to the building and so on. You'll also be bringing in an extra income, so be prepared for that to affect your income taxes. On the more positive side, many of the extra expenses involved in being a landlord can be written off on your taxes too, so you might be able to recoup some of the costs. This is one area where you can use the advice from local landlords to find a new tenant. Ask them where to look for the best places to find a good tenant in your area. There are many options out there, including Renter’s Magazine, classified listing websites such as Kijiji, Craigslist, or the good old-fashioned newspaper. Another thing you may want to ask an experienced landlord is what qualities they look for to help them narrow down their search for the best tenant. Once you’ve found a tenant to rent your space, the last (and arguably most important) step is to have them sign a lease. This agreement will outline the rules and responsibilities of the tenant and the landlord, the length of the agreement, and late payment penalties. 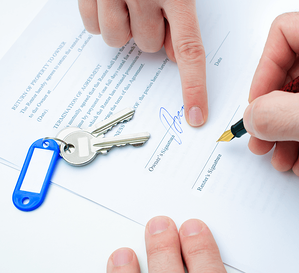 The lease should be signed by every adult tenant that will be living in the house. There are many examples of lease agreements online, however always consult with your lawyer before having your tenants sign. Taking the steps outlined above will ensure you protect yourself and your tenants, while also ensuring you set out on the right path to becoming a landlord. You will thank yourself later as you have a pleasant experience, which will make you want to continue this role and reap the financial benefits for many years to come. *Originally posted November 4, 2016, updated October 19, 2018.